Chelsea blogs at Patch the Giraffe and can also be found on Facebook, Intagram, and Pinterest. Chelsea's top came to me looking like this. Amazing right? Also small. The whole thing was only about 36 inches in size. But that's perfect. Chelsea is aiming for this to finish at about lap quilt size. I was worried that I wouldn't have enough solids in the colors Chelsea had requested so I started by digging through my stash and was pleasantly surprised to find a wide variety of colors to pull from. 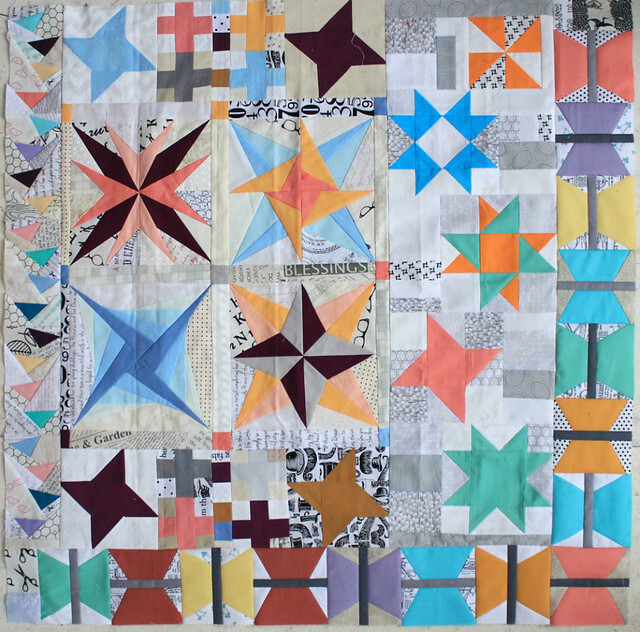 I was immediately drawn to those paper pieced stars. They finish at 8". I really like how they balance out the smaller borders and piecing. So I set to work choosing and sizing the templates I would need. My original goal was to make four or five stars and set them along one side, similar to how Chelsea had set her original center. I made three blocks before I ran out of time. As it was I was over a week late mailing this off to Leanne. At that point, my "make it work" came to the rescue. I re-purposed some of the orphan pieces in the bag and made some quilt low volume flying geese to fill in some of the blank spaces and got to work piecing together my addition. Though this isn't what I originally pictured when I started working on Chelsea's quilt, I'm happy with how it came out in the end. 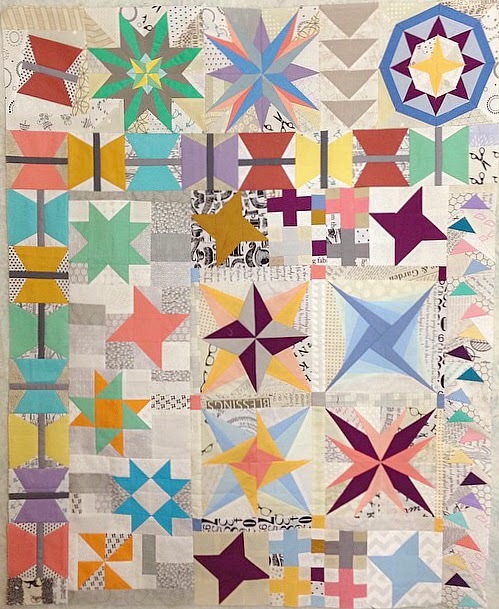 The larger stars help to balance the weight of the quilt and I like how that one extra butterfly block is escaping out of the neat and tidy row that Liz added before me. Chelsea I hope you like it! I think your stars look great, and I like how you continued the butterfly border up into your own; very nice! Your blocks look so good and are a beautiful addition to the quilt top. I love your description of the butterfly who escaped, and adding it at an angle gives added interest. Nice job! How cool! I love how this quilt travels from home to home and each person puts their special touch on it! Really so gorgeous! I had noticed that butterfly at an angle and loved that addition! Your star blocks are great too...I love stars that have so many angles to them! I love how you added more stars! That looks great and the one butterfly was a great solution, it adds so much! Thanks for an awesome boarder. I am so pleased with everything so far! Is it July yet?!? !